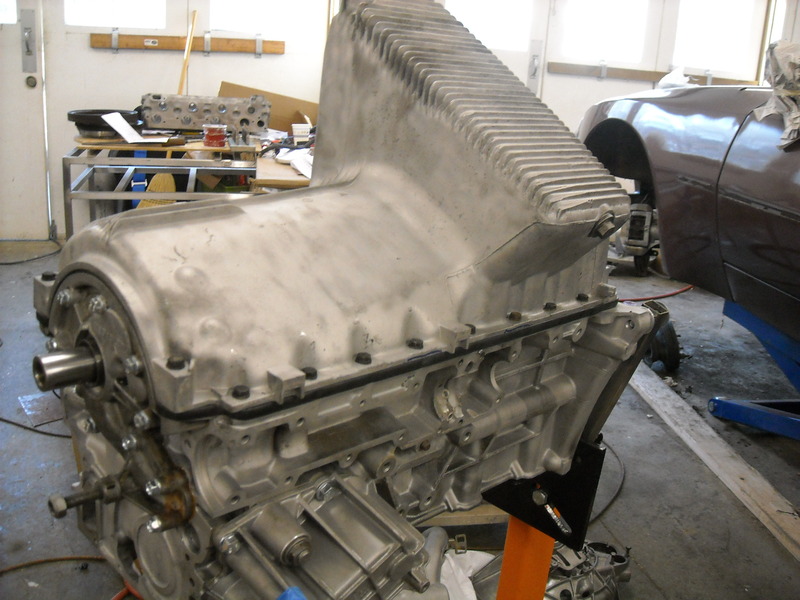 I got started on re-assembly of the engine. First I decided to make a fixture for the standard mounting bracket on my engine stand that would allow me install the flywheel. Having the Porsche shop manual at your side as you assemble the engine is mandatory. 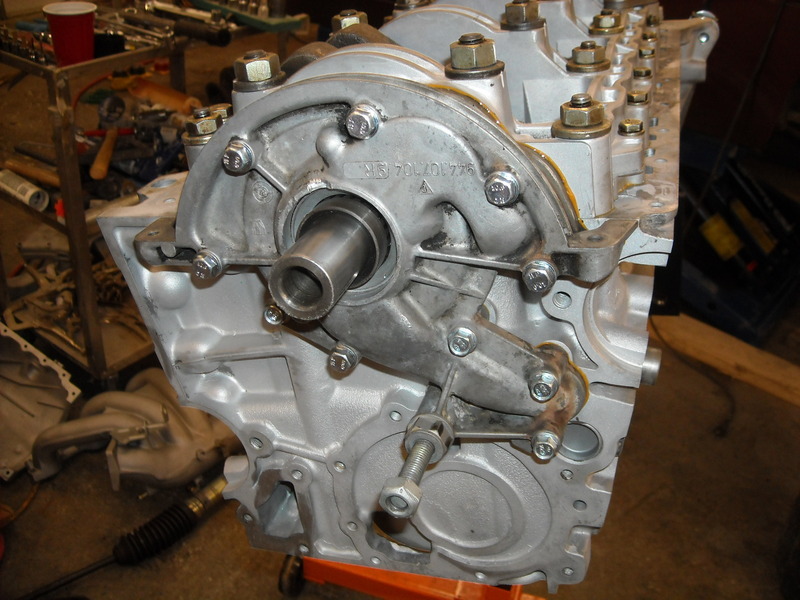 It gives you all the correct torque values and helps you avoid pitfalls. Having the PET diagrams is almost as helpful. One annoying problem for me was that I bought a “bottom end” gasket set from Paragon. Nothing wrong with the kit per se, except all the gaskets are thrown into one bag. Even with shop manual and the PET, identification was a little difficult for a newbie like me. 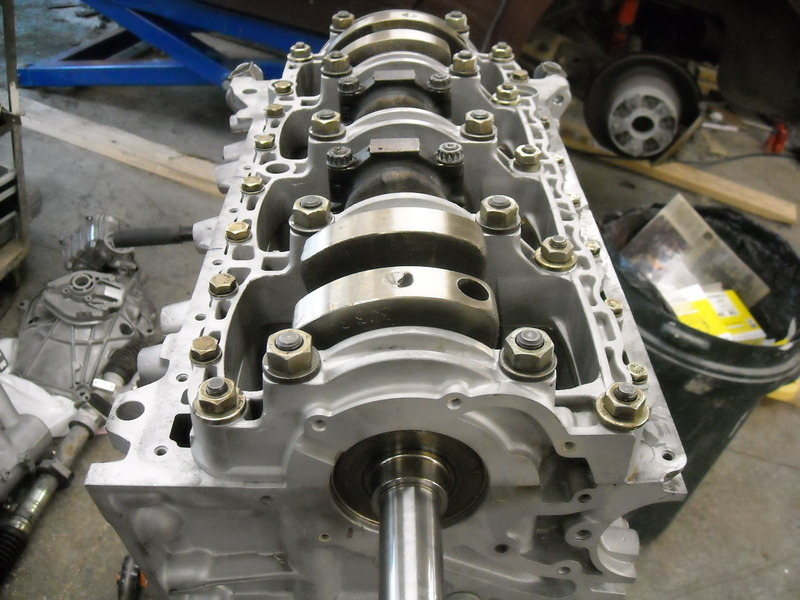 Anyway, the first step was to install the crankshaft with new bearings and its rear main oil seal. The crank is held is place with a very robust “crank girdle”. Without giving away the surprise ending, I will go into a little more detail on the girdle. One side of the girdle covers up a “trough” in the block that serves as a passageway to move oil from the pickup tube to the oil pump. The shop manual specifies a specific type of Locktite to seal the girdle’s perimeter around this trough. It even has a drawing showing exactly where to put the Locktite. It seemed like a simple procedure as I did it. 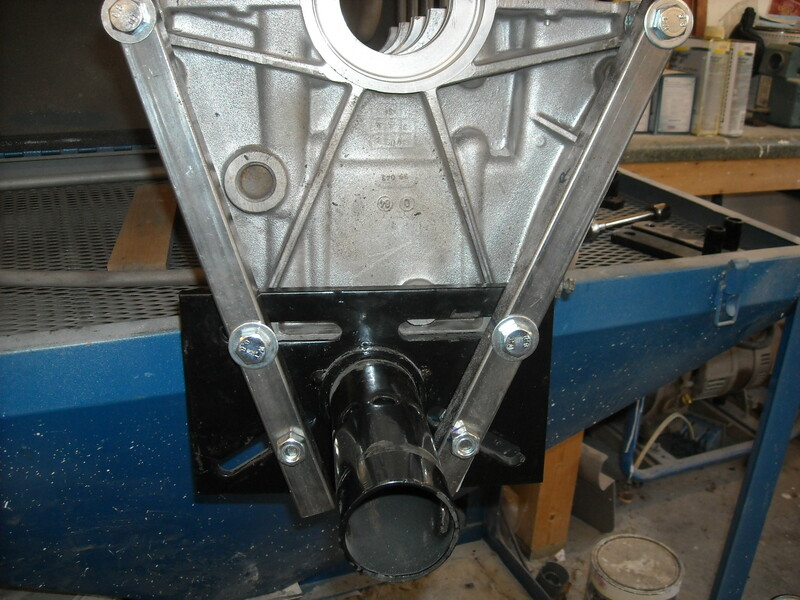 The girdle is held down with a series of bolts, torqued to specific values per the shop manual. The girdle goes partially over my JB Weld repair area. Let me tell you, that is one beautiful, stout bottom end! Porsche does not cut corners. 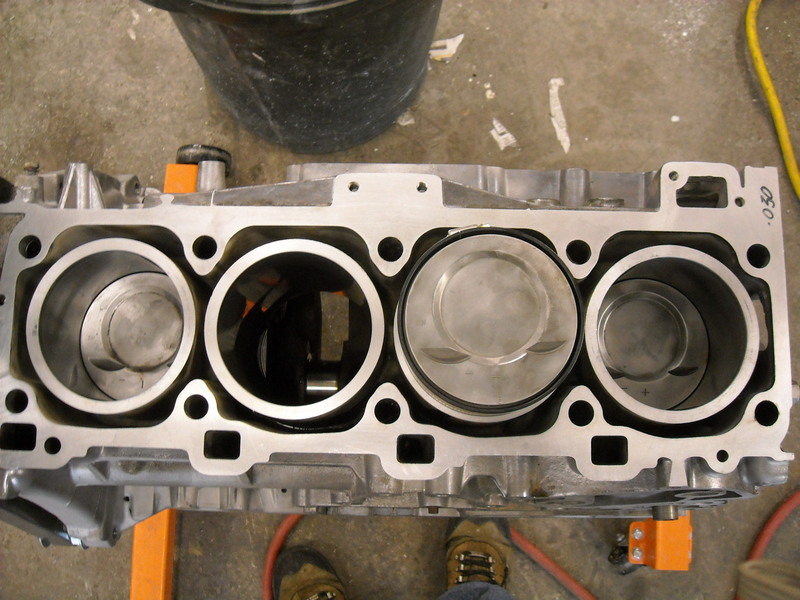 Next was the pistons, rings, connecting rods, and rod bearings. You have to read the instructions that come with the rings carefully to know which way they are oriented. 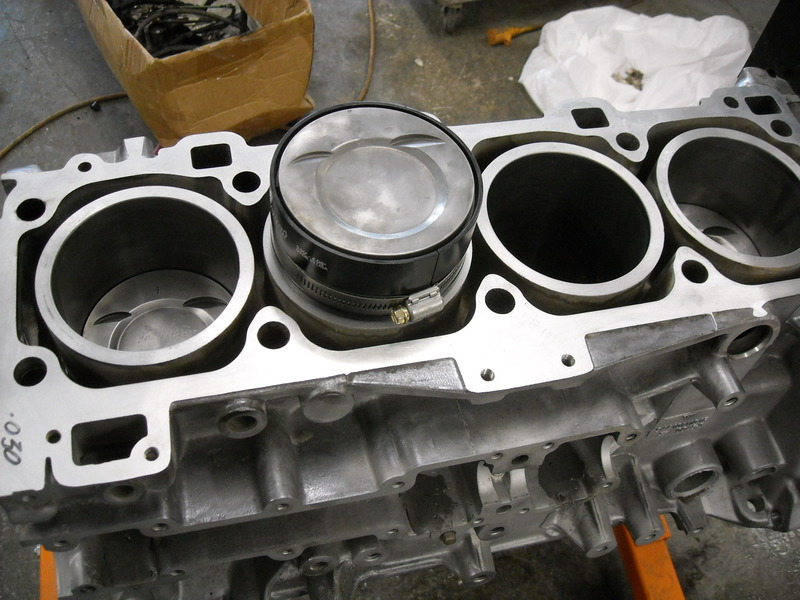 I used an inexpensive ring expander tool to fit the rings onto the pistons. I bought a ring compressor from Summit, shown in one of the following pictures. Before you install the rings on the pistons, you can let them into the cylinder hole and check to see if their end gap is within spec. Mine were OK. Make sure you orient the pistons with the valve pockets on the correct side. I managed to mangle the oil scraper rings on the first piston install. Although I checked the end gap on the compression rings, I didn’t think it was necessary on the oil scraper ring. Wrong! After puzzling over why the scraper ring was mangled, I took another scraper ring and let it into the cylinder hole. It was too long! I had to trim the end of the scraper ring on the grinder to get a decent fit. 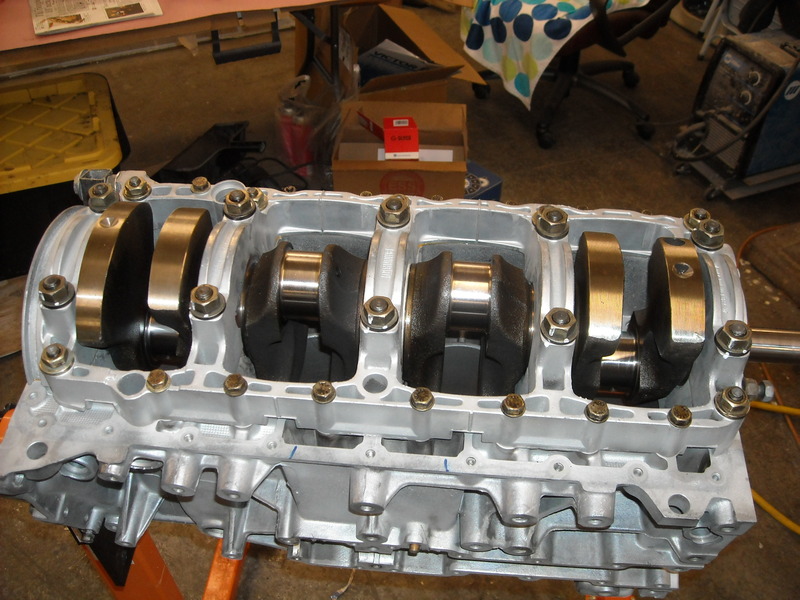 The other 3 pistons went in OK but I had to order a new set of rings to finish the job. 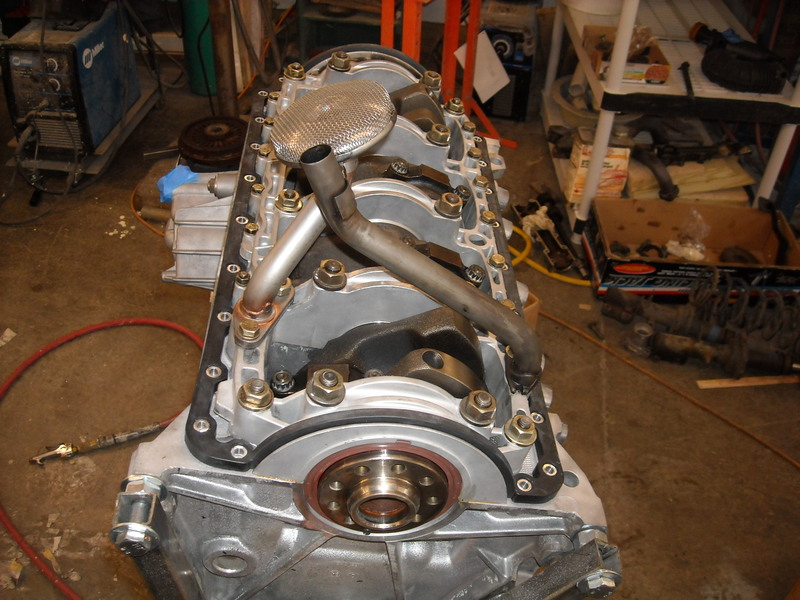 Next I fit the oil pump on the end of the crankshaft. It uses the same Locktite as a sealant. Next I put on my new oil pickup tube and the old oil return tube. Then I fitted the sump. 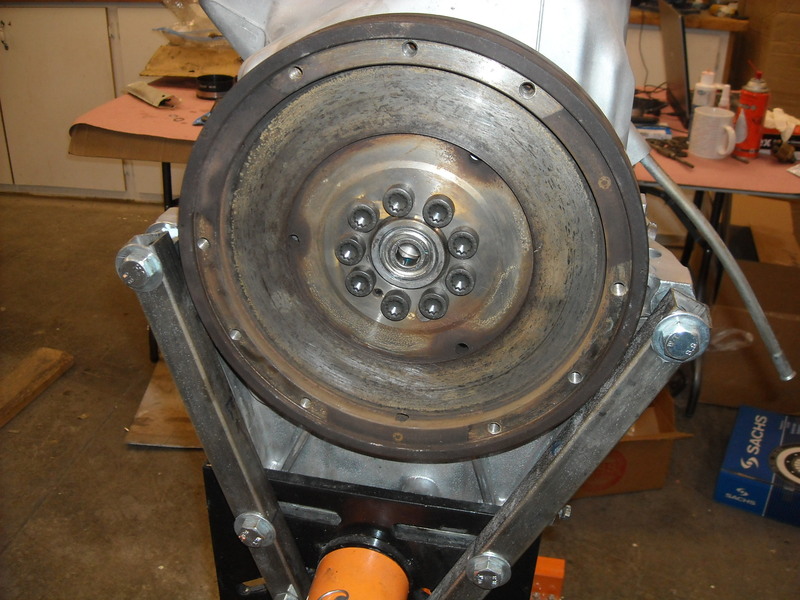 Next I installed the flywheel. I was ready to install the head. But there was a problem. The machine shop was really dragging its feet. It ultimately took me 2 months to get the head back from them. Crazy but it was over the Christmas holidays and that was just how it worked out. In my next post, I will jump ahead to the head install and then circle back around to stripping the interior, new dash, wiring, etc.